Compost adds valuable organic matter to soil, improving its structure and making it easier to work and more productive. Add it to sandy soil to increase moisture-holding capacity, to heavy clay soils to improve aeration and drainage. In addition, compost introduces beneficial microorganisms to soil and makes slow release nutrients available to plants. Worms, a great indicator of soil health, thrive in soils rich in composted organic matter. Although plants love our compost, best results are achieved when it's amended into good quality soil with a relatively neutral pH or a pH appropriate for specific plants. Although we don't recommend planting directly into compost, we know some gardeners do. If this is your preference, we recommend trying a small pilot plot and observing the results before embarking on a major garden project. Ask your salesperson about the maturity of the compost you'll be applying and whether it's appropriate for the use intended. Compost maturity is the result of a natural, biologic process that is affected by factors such as feedstock type, weather, moisture and time. The need for compost maturity can vary. Seeds, or tender young plants for your backyard garden or landscape typically require more mature compost. In applications such as new vineyard development, younger compost might be desired. Application rates will vary according to soil type, condition and the plants you will be growing. Generally, sandy soils with little organic matter, or heavy clay soils that don't drain well, benefit from a heavier application of compost. Typically, two to three inches of compost amended into the top six to twelve inches of soil will be appropriate in sandy or heavy clay soils. 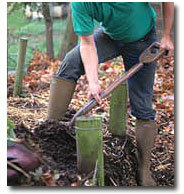 One inch of compost in a good quality loam soil will usually be adequate. You may use an online calculator to estimate your needs. Mulches are used to add beauty to landscapes, suppress weeds, conserve moisture and control erosion. In addition they help moderate soil temperatures and attract earthworms. As they slowly break down, mulches provide additional organic matter and a modest input of nutrients to the soil. Generally, a layer of mulch 2 to 4 inches deep is sufficient if refreshed annually. 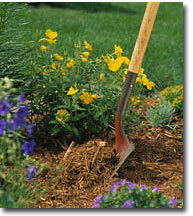 Mulch can be applied with a garden fork and evened out with a rake. In agricultural applications, a tractor pulled spreader is often used. Be careful to keep mulches several inches away from the trunks of trees or the stems of smaller plants and shrubs. A layer of old, moistened newspapers (2-3 sheets) or cardboard placed on your soil prior to applying mulch will greatly enhance weed suppression. After application, gently water in mulches. This will "set" the mulch and keep it in place in windy conditions or on steep slopes. It will also help create a healthy interface with underlying soil or a newspaper or cardboard weed barrier.